How to Turn your Stress from 100 to 0 by Practicing these Five Simple Yoga Poses! Home » Asanas » Knowledge Base » How to Turn your Stress from 100 to 0 by Practicing these Five Simple Yoga Poses! The value of this sequence of relaxation poses cannot be overemphasized,they must be done in advance than and after the yoga session and at any time when the body turns into worn-out. The asanas in this group seem very easy and handy in the beginning, but to do them correctly is a little complicated because the anxiety in all the muscle companies of the frame must be consciously released. The muscles usually seem to be absolutely comfortable but, tightness nonetheless remains. Even throughout sleep, relaxation is elusive. The asanas of this group provide the body the relaxation it so longly wishes. Consistent postural abnormalities put extra stress on the muscle tissues of the back which hardly get hold of correct relaxation within the traditional supine role. The stress of any kind is not good for the body and Yoga is the only form of art which heals the body not only at the physical level but digs deeper to the cellular as well as emotional level, which is essential for holistic healing. 1) Savasana : I have mentioned about this magical asana in my earlier posts as well, Savasana ,unwinds the entire psycho-physiological framework. It is advised to practice it before rest; before amid and after asana rehearse, especially after element works out, for example, surya namaskara; and when you feel physically drained. It creates body mindfulness. At the point when the body is totally casual, the consciousness of the mind expands, creating pratyahara. It is also called as corpse pose , one just needs to lie down in corpse position and let your mind enter the state of meditation by simply focusing on the breathing. Unwind the entire body and stop all physical development. End up being mindful of the characteristic breath and permit it to end up cadenced and loose. 2) Advasana : This is a very simple asana but requires a lot of focus to not let the mind wander,lie on the stomach. Extend both arms over the head with the palms facing downward The brow is supposed to lay on the floor. Unwind the entire body in an indistinguishable path like savasana. On the off chance that there is trouble breathing or a feeling of suffocation is encountered, a pad might be set under the mid-section. Relax in a common and cadenced manner. The quantity of breaths might be included as savasana while tenderly pushing the guts against the floor. 3) Jyestikasana : Lie level on the stomach with the legs straight and the brow laying on the floor. Interlock the fingers and place the palms on the back of the head then again neck. Permit the elbows to lay on the floor. Unwind the entire body and get to be mindful of the breathing procedure as depicted for savasana. Breathe Naturally and rhythmically. Feel the mitigating warmth of the palms liquefying without end the pressures in the neck and related ranges. This asana is useful for every single spinal dissension particularly cervical spondylitis and hardened neck or upper back. 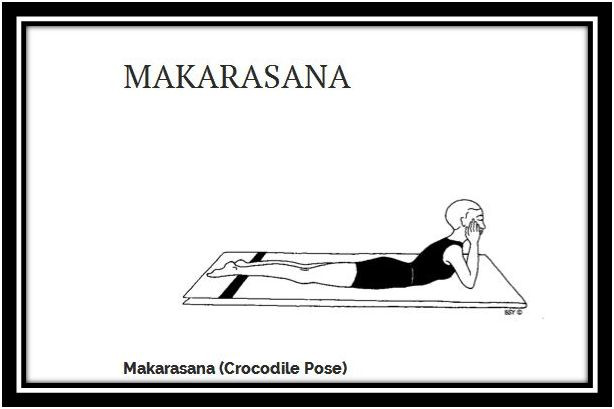 4) Makarasana : It is also called as (crocodile posture) Lie level on the stomach. Raise the head and shoulders and rest the button in the palms of the hands with the elbows on the floor. Keep the elbows together for a more professed curve to the spine. Isolate the elbows marginally to assuage abundance weight on bite the dust neck. In makarasana the impact is felt at two focuses: the neck and the lower back. On the off chance that the elbows are too far in front, pressure will be felt in the neck; on the off chance that they are attracted excessively near the midsection, strain will be felt more in the bring down back. Alter the position of the elbows so that these two focuses are similarly adjusted. The perfect position is the point at which the entire spine is similarly casual. This asana is exceptionally compelling for individuals experiencing slipped plate, sciatica, or some other spinal issue. They should stay in this asana for augmented time frames as it empowers the vertebral section to resume its ordinary shape and discharges pressure of the spinal nerves. Asthmatics and individuals who have some other lung afflictions should practice this straightforward asana routinely with breath mindfulness as it permits more air to enter the lungs. 5) Matsya Kridasana : Lie on the stomach with the fingers interlocked under the head. Twist the left leg sideways and convey the left knee near the ribs. The right leg should stay straight. Swivel the arms to one side and rest the left elbow on the left knee. Rest the right half of the head on the law breaker of the right arm, or somewhat assist down the arm for more solace. Unwind in the last stance and, after a few time, change sides. This position takes after a fluttering fish. This asana empowers digestive peristalsis by extending the digestion systems and evacuates obstruction. It diminishes sciatic torment by unwinding the nerves in the legs. Individuals with spinal pain, for whom the act of forward twisting asanas as is most certainly not prescribed, may rehearse matsya kridasana as a counterpose after in reverse twisting asanas. In the later months of pregnancy, lying on the back may bring about weight over major veins and piece the course. In such conditions, this stance is perfect for unwinding, dozing or honing yoga nidra. The bowed knee and the head might be upheld on a pad for advance solace. This asana additionally redistributes overabundance weight around the waistline.